According to the UK Government, there are more than 37 million licenced vehicles in the country as ofMarch2018. This staggering number of cars needs a large workforce to keep them working correctly. Unfortunately, there has always been a vacuum of trained professionals to repair and maintain the vehicles of this country. And that’s where we, Easington Service Station, come in. 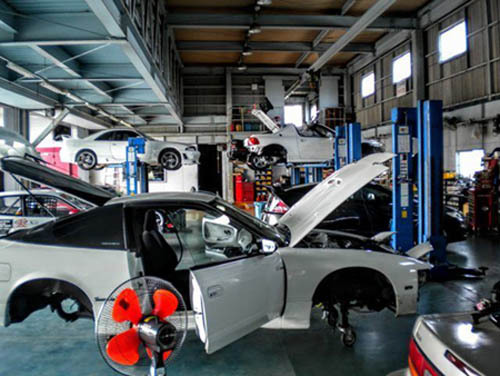 We are a leading car service garage in Easington, and we are here to provide you with excellent repair services at very reasonable prices. A modern-day vehicle is a combination of thousands of components. If even one of them breaks down, the entire system starts malfunctioning. That’s why a well-maintained repairing schedule is so important to extend the service life of your vehicle. Experts recommend at least one inspection every year to check for any malfunctioning parts. Also, you should keep an eye out to identify any issue. Look for signs like low power output, engine overheating, delayed start etc. Also, there can be issues with other components too. In specific scenarios, you might feel that the brake pedals have gone soft, or the headlights are not as powerful as they should be. All these should prompt you to bring your car to Easington Service Station for a car repair in Easington. We do a wide variety of car repairs and provide a host of services at our garage. Let’s talk about a few of our most sought-after packages. A car's engine withstands extreme heat and stress. That can damage its components. Our repair package targets these parts and fixes them to bring back the original output of your car engine. A complete visual inspection of the engine bay, housing, and connectors and timer belts. Fuel pump and fuel tank repair or replacement. Inspection and if needed, repair of the connecting rod, crankshaft, oil sump, and other parts. Measuring and optimising the timing cycle. A thorough inspection of the piston, piston rings, gaskets, spark plugs, and other components. Another essential part of your car is its radiator. It uses coolant and allows air to maintain an optimum temperature in your car engine. However, due to excessive stress, the pipes connecting the reservoir can break. Also, coolant pumps can malfunction. Inspection and repair of the fan belt. Repairing any leaking radiator hose. Repair of the serpentine belt and its connectors. Thermostat repair, calibration, or replacement. Cooling sensor optimisation and repair. Water and coolant pump repair or replacement. Also, when you visit our car service garage in Easington, we will check the coolant reservoir for any leaks. If there is any, we will fix it immediately. Changing suspension coils and dampeners. Inspecting and repairing the differentials. Testing the efficiency of the unit. Checking its performance with a controlled test. Checking for any leaks with a leak test. When you bring your vehicle to our car service garage in Easington, you willreceive the best facility at the most affordable price point. And don’t worry if your car is too old and you don’t want to repair it anymore. We buy old vehicles, scrap cars, and offer services like general vehicle disposal. Bring your car to Easington Service Station whenever you face an issue with your car in Easington, Saltburn-by-the-Sea or Cleveland. We are open from Monday to Friday, 8:30 AM to 5 PM. On Saturdays, we are available from 8:30 AM till 2 PM.